A really nice find!! In very nice condition, with little wear to the surfaces. 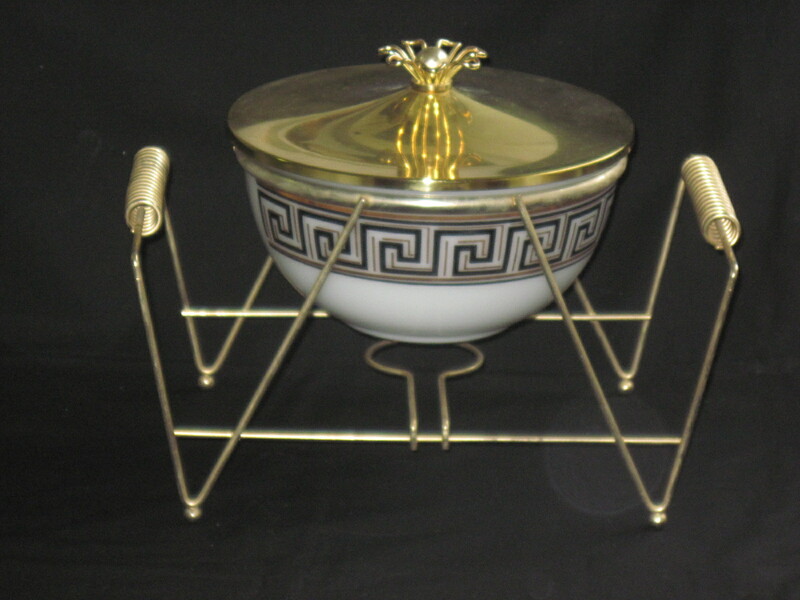 The bowl is by Fire King and it has a gold and black greek key pattern along the top edge. It sits in a candle warmer stand and has a brass coloured metal lid. This dates to the 1950’s or early 60’s. There were several artists that designed these patterns for Fire King; Fred Press and Georges Briard were two that I know of. This particular bowl is not signed so I can’t attribute it to one of the aforementioned artists. Please note I do not ship items. This will be availabe in my booth at the Ottawa Antique Show at the Carleton Univertisty Fieldhouse on Oct 25th and 26th 2014.